'Healing Through Harvesting': Gleaning Unwanted Fruit Helps Refugees In Need : The Salt A volunteer network not only gathers wasted, oft-ignored foods and turns them into healthy meals, but also provides community and opportunities for those whose lives have been radically disrupted. 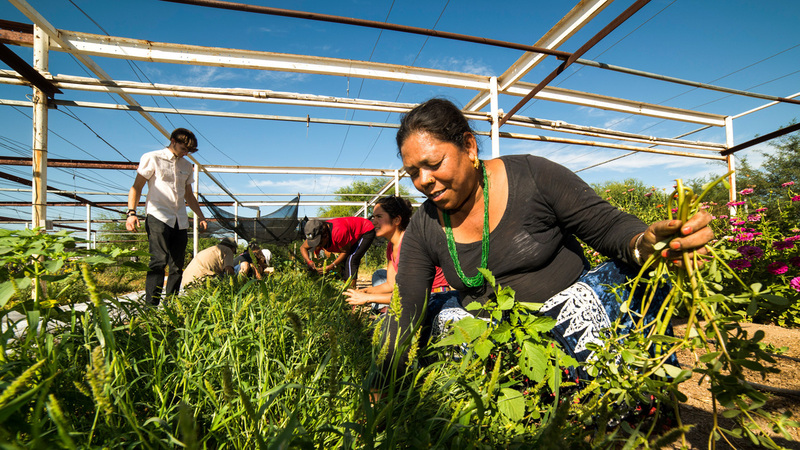 Iskashitaa participant Rogita Darji, a refugee from Bhutan, gathers purslane, an edible plant to some, but considered a weed on a farm in Tucson, Ariz.
Tilahun Liben thought he was seeing things. Surely that mound of orange orbs under those trees near his church couldn't be oranges. Could they? It was 2010, and Liben had just arrived in Tucson, Ariz., as a refugee from Ethiopia. He had been a musician, playing saxophone in nightclubs, but that life ended abruptly in 1999 when an oppressive regime imprisoned him for three months for his political dissent. After Liben's release, further persecution forced him to flee his homeland: He ended up at the Kakuma refugee camp, in Kenya, where he waited 10 years to be resettled. Liben, 46, hadn't been in the city more than a few months when he met Barbara Eiswerth, an American who had, by chance, visited Kakuma during Liben's stay. Here in Tucson, Liben learned, Eiswerth had founded an organization called Iskashitaa Refugee Network that helps refugees find community and purpose through gleaning backyard fruit, which they eat themselves and share with other Arizonans in need. Gleaning — or harvesting unwanted fruit — was a new concept to Liben. Then again, so was the sight of oranges and grapefruit piling up beneath trees. "In Ethiopia, the owner of the tree will get the fruit to the market," Liben says. "And when there was fruit on the ground, people would pick it up and use it. There's no waste." Within days, Liben was knocking on Iskashitaa's door. 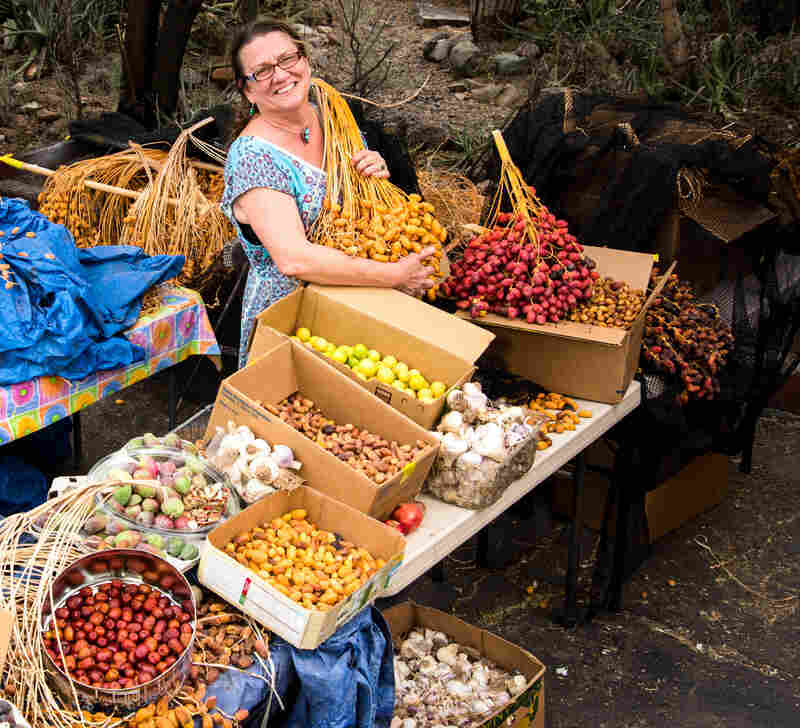 Eiswerth started Iskashitaa in 2003, after she mapped Tucson's public fruit as part of her doctoral program in geology — a project that revealed to her the area's edible inventory. Not wanting that bounty to go to waste, she and her colleagues had distributed it at several "free farmer's markets." One of these events specifically targeted refugee children, whose enthusiasm for the gleaned fruit blew Eiswerth away. "I thought, wow, the need is here in this refugee community,"she says. 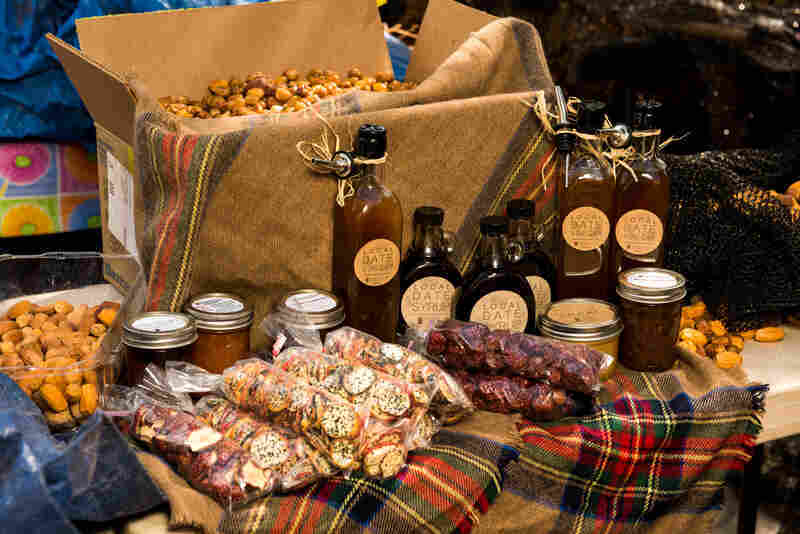 "Why not teach them about local food resources while teaching them to fit in?" The produce makes a difference to Tucson's refugees, who despite having an organizational sponsor, often live in poverty. In nearly two decades of working with refugees, Eiswerth, 55, has seen the depth of their talents and skills, but also their hardships. "I've gone into refugee homes and opened a fridge to see a gallon of milk, a few bottles of water and a few fruits," she says. While Iskashitaa doesn't pay refugees to glean, Eiswerth does whatever she can to help them out — offering gift cards, clothing vouchers, donated toiletries, referrals to grief and trauma programs, and, of course, hundreds of pounds of fruit. Iskashitaa — which means "working cooperatively together" in Somali Bantu, the ethnicity of many early volunteers — provides more than just healthy food. It also serves as a refuge and an opportunity for those whose lives have been radically disrupted. "We provide healing through harvesting," Eiswerth likes to say. "We help refugees belong to something, and we give them a chance to give back to a country that gave them a second lease on life." For some, that sense of community is as important as Iskashitaa's mission. Faeza Hililian, an Iraqi refugee of Armenian descent, volunteers at Iskashitaa partly because she has the time — she's a retired dentist — and partly to keep her mind occupied. "I don't like to stay home and think about the past and get sad. Nobody can imagine how in one minute you can lose everything," says Hililian, 70, whose family spent more than three years in Syria before being accepted into the United States. "The waste makes me so sad because a lot of people around the world don't have anything to eat," Hililian says. "I am happy to work to save every food [item], because I think, 'We could use that!' You can make many things out of the fruit and vegetables — juice, pickles, jam. Don't give it to the garbage!" And so Iskashitaa extends the shelf life of citrus by making jam and converting dates into honey in the commercial kitchen of a local church. It also holds free classes on gardening, cooking, juicing, dehydrating, fermenting, pickling, canning and making fruit syrups, which it sells at farmer's markets. Refugees also coax meals from often-ignored foods. Floyd Gray, a longtime volunteer and fruit donor, said he's learned plenty from having refugees harvest his garden excess. When Iskashitaa sent a few Iraqis to pick grapes from his home arbor, Gray was thrilled to learn that the leaves were also sought to make rice-stuffed dolmades. And he was surprised when a few West Africans harvested his squash leaves. "They just boiled 'em up and ate them! It's pretty interesting to see other people's cooking styles and what they do with things we never thought were edible," says Gray. "Now, I eat the leaves from cauliflower — I cook it up with collard greens and mustard greens." But the prime "use-it-all" example is the Seville orange, widely planted in Arizona as a decorative tree but ignored as the sour or "poison orange." That characterization appalls Iskashitaa volunteers from Iraq, where those oranges are a key culinary component, akin to lemons. "The sour orange is like medicine," says Hililian. "You can make jam with it, you can do all kinds of things." Over the years, Iskashitaa, which has an annual operating budget of $100,000, has steadily matured, incorporating the expertise of new participants, both refugees and University of Arizona students from a wide range of programs who flock to intern and volunteer. 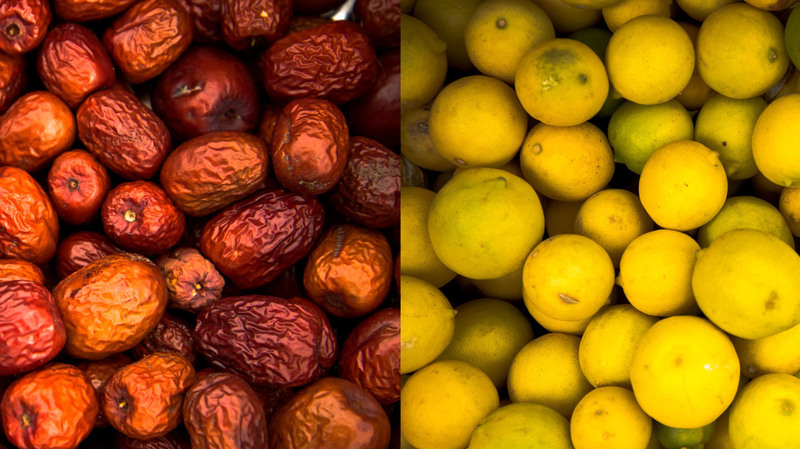 The bounty at Iskashitaa include jujubes, left, and limes, right. But the organization's growth hasn't been without friction. Scale has become an issue. Eiswerth recently filled a local pool with citrus to show that the organization was, literally and figuratively, swimming in grapefruit. (A single citrus tree can yield 1,500 pounds of fruit.) 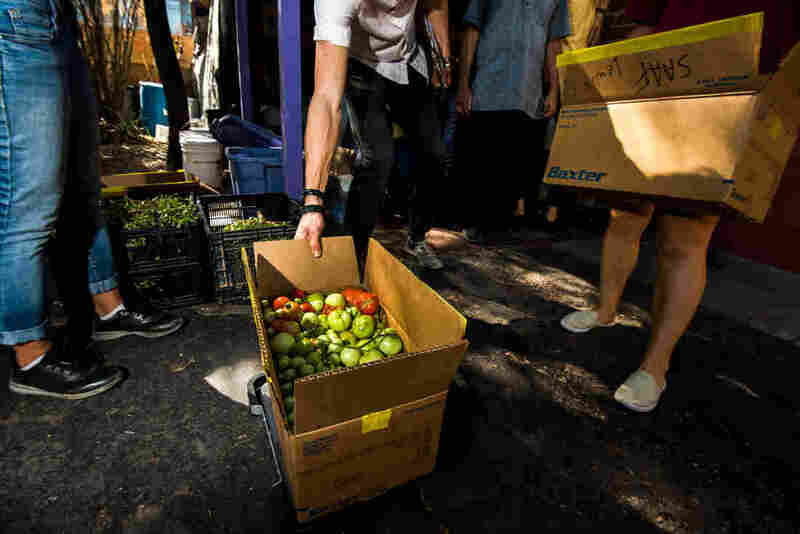 Lacking refrigeration, the group stores produce in the shade of its adobe headquarters, where black and green milk crates brim with orange and yellow citrus, and blue tarps house the overflow. "If someone would like to donate a truck-in or walk-in cooler," Eiswerth says, "that would be great. It's 102 [degrees] outside now." President Trump's current refugee ban and anti-immigrant rhetoric also pose challenges for an organization working with refugees from five of the original seven blacklisted nations. Eiswerth says that refugees are equally scared and discouraged by developments. But the political turmoil also provides a teachable moment. Since the election, Eiswerth says, "we have an opportunity to educate and engage more people. Churches who never mentored a refugee family before are now doing it. I think it's profoundly impactful for American-born families to meet a refugee for the first time and experience their life for a minute." Liben, the Ethiopian musician, feels that his American experience demonstrates that refugees bring more than they take. Despite working full time at a nursing home, he still volunteers at Iskashitaa, occasionally plays saxophone at group events, and serves as a board member. "All the refugees I know who have come here, they all learned how to work hard. They are living peacefully with no trauma in a free country. They say 'God Bless America,' because America provides a lot for us." Liben pauses for a moment, and smiles. "But also, we are the ones who bless America with our hard work." This story was produced in collaboration with the Food & Environment Reporting Network, a nonprofit, investigative news organization. Jonathan Bloom is the author of American Wasteland and the creator of wastedfood.com. He regularly writes and speaks on wasted food, and his work has appeared in The New York Times, National Geographic, The Washington Post, The Guardian, and Newsweek.